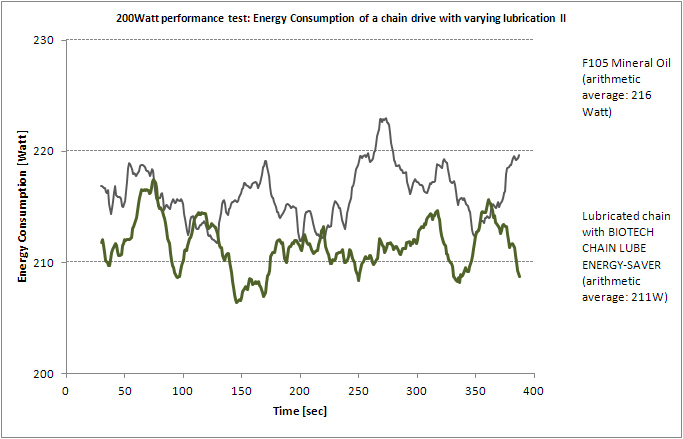 The dark grey gradient shows the energy consumption of a degreased chain drive. The arithmetic average is 222 Watt. This gradient is also ascending. 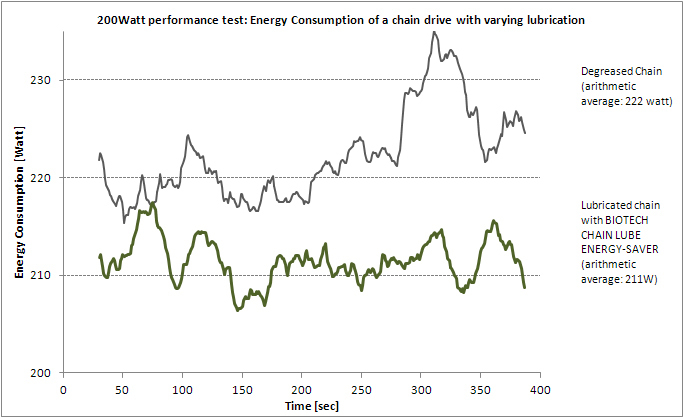 In direct comparison to the degreased chain our BIOTECH CHAIN LUBE ENERGY-SAVER shows lower energy consumption with an arithmetic average of 211Watt. The aim is to demonstrate how important it is to lubricate the chain of a chain drive with a High Performance BIOTECH-Lubricant. Without lubrication you have higher wear and at least five percent higher energy consumption. In the near future we will show you a test cycle which will show if the degreased chain uses much more energy under long-term test conditions. The test rig consists of a power ergometer which is connected to race bike (Cyclus 2, RBM electronik-automation GmbH). The test modus is watt-controlled training with 200 Watt adjustment. The data-sampling rate is one data point/sec and the displayed gradients are 30 data point moving averages. The individual data points are not shown. Datas of pedalstrokes are obtained with a power sensor equiped treadle (STAGES powermeter XTR). The dark grey gradient shows the energy consumption of a chain drive which is lubricated with F105 mineral oil. The arithmetic average is 216 Watt. In direct comparison to this mineral oil product our BIOTECH CHAIN LUBE ENERGY-SAVER shows lower energy consumption with an arithmetic average of 211Watt. This demonstrates how you can save energy when you are using High-Performance BIOTECH Lubricants instead of a mineral oil product. In the near future we will run further performance tests with a longer test cycle in order to show you the positive long-term capability of our BIOTECH lubricants. The standard mineral oil product exhibits higher energy consumption at every stage of this performance test. At the lowest power stage you can save 5,3% energy with Bio Hydraulic Oil. At the highest stage at 2000kN you can save impressive 15,5% energy. 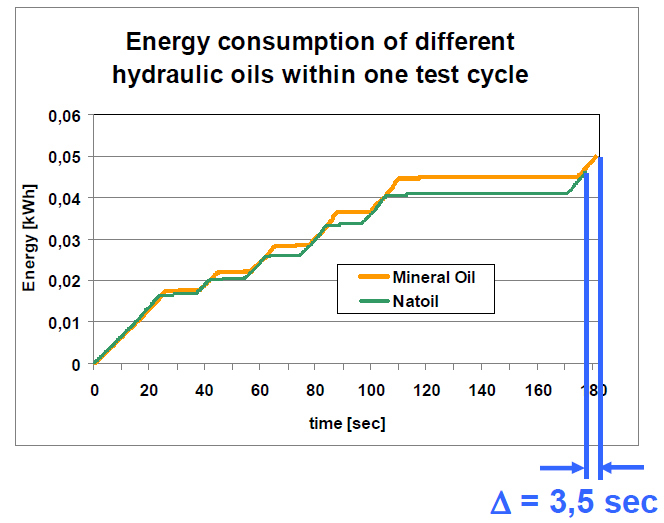 A second important result ist he faster cyclus oft he Bio Hydraulic Oil. The cyclus was finished after only 176,5 seconds which means a significant higher productivity.